Many enterprise and professional users has been starting to use SSDs as the main internal drive, which results in an overall better system performance. However, this leaves a smaller built-in storage capacity in the host system. Therefore, having a secondary storage has been becoming increasingly important to enterprise & professional users, especially in the media and small business field. This is because of the increase of various file sizes such as 1080P HD videos, high resolution RAW images, large office backup files, etc. Also, accessibility, silent operation, and security are important factors when using project files at work environment, studio, home or on a business trip. DJ’s, video / audio editors, small businesses, music producers and photographers, are several examples of who require additional storage to be truly successful at their profession. In selecting potential storage solutions, however, being able to quickly insert & remove hard drives, providing security in an unsecured environment, and transporting your hard drive from various locations, are all important situations and features to consider. 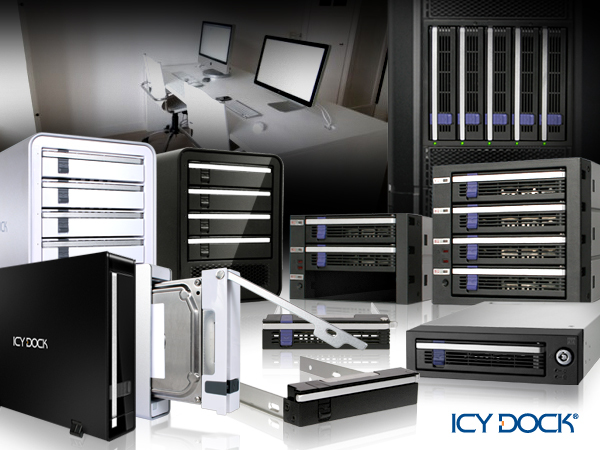 Our solution allows you to have all of this, which are the ICY DOCK Professional Removable hard drive enclosures. If you have a system that is small, fixed, or not capable to expand the storage capacity from inside, external enclosures are specially designed for these situations. The MB559U3S series is equipped with high performance USB 3.0 & eSATA interface, using a unique removable & hot-swap tray feature for easy swapping in seconds. The USB 3.0 & eSATA is supported in most new computer systems, including the new Macbook Pro. The USB 3.0 interface is also backwards compatible for any legacy PC or Mac systems that still rely on USB 2.0. For enterprise users, locking the enclosure in the office with a Kingston lock will be able to help prevent theft of the enclosure and drive. However, removing the drive from the enclosure, promotes additional security. If multiple MB559U3S enclosures are used, moving from one place to another is simple. Other features like the aluminum body, ultra slim design, and built-in expandable foot stand, provide flexible utility, meanwhile, making the work environment a professional feel. Expanding capacity is just as simple as all that is needed is a new hard drive, and an extra tray. If sharing of data and high storage capacity are needed, the MB561US-4S-1 quad bay enclosure allows up to 12 TB of total storage, while still enjoying the hot-swap feature. Expanding internal storage becomes quite easy using the MB876SK-B or MB45X series. For the MB45X multi-bay series, it provides at least one more 3.5” hard drive slot, relative to the same storage space available without the multi-bay installed. For example, the MB453SPF-B takes 2 x 5.25” device bay to be installed, but provides 3 hot-swap drives instead of 2. For the MB455SPF, it takes 3 x 5.25” device bay, but provides 5 hot-swap drives instead of 3. Also, the addition of aluminum build and 80mm fan allow overheating of hard drives to be the last thing to worry about. Once the system is installed, all that is left is to insert your hard drives using the included removable trays. Instead of opening up the computer and removing the hard drives, all that is needed is to eject the tray out of the enclosure system to take home the necessary data to work on. Besides all these great features, the MB876SK-B and MB45X series all fully support SATA III / 6Gbps speed for maximum performance. For any person, enterprise or application that requires data storage, it is important to look for a flexible storage solution. How easily you can move the data from location A to location B, how quickly you can remove the failed drive from a RAID array without a long system downtime, and how to be able to swap hard drive data between internal and external systems, are crucial elements to consider when purchasing a storage solution. Lastly, make sure that the solution is a well known brand name in the respective field, with good warranty converges. Please click on the product icons above for the product information.